MUSE Museum of Science. Discover Lake Garda! The new Museum MUSE is an architectural jewel whose artistic design continues inside the building. The future-oriented profile reflects the mountain landscape of the area, and the various levels of the building designed by architect Renzo Piano pay tribute to the mountains of Trentino. Futuristic is not only the concept and the construction of the MUSE but also its surroundings. The building and the surrounding park have been integrated into an urbanistic project and will in future be a central element of a modern district, which will include apartments, shops and offices. The energetic concept was also exemplarily implemented. 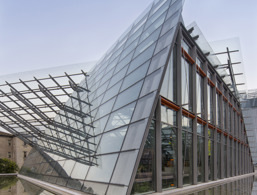 The building has good insulation and was constructed using multiple renewable energy sources such as photovoltaic and geothermal energy according to the latest findings of environmentally friendly low-energy architecture. After the accredited certification process according to LEED, it was awarded the degree of GOLD. The Museum of Science in Trento presents itself to its visitors in an entirely new and innovative way. Interested parties are encouraged to participate in the research process interactively. 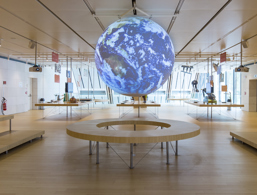 The MUSE offers hands-on science for all ages, focusing on a wide variety of topics, from the creation of the earth to the local mountain world. It invites visitors to immerse themselves in different landscapes, such as an alpine glacier, a tropical rainforest, and an interactive forest, to help them understand the conservation of nature and sustainable development technologies. 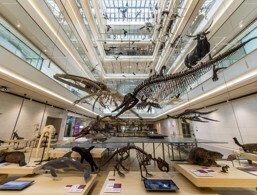 Highlights of the modern concept include the exhibition on dinosaurs, the large greenhouse with rainforest and waterfall, the Maxi Ooh! - an interactive space that will astonish the very youngest museum visitors and the FabLab, where you can produce almost everything digitally using the latest technologies. The museum covers a total of 12,000 m², with 3,700 m² of permanent exhibitions and 500 m² of temporary exhibitions. 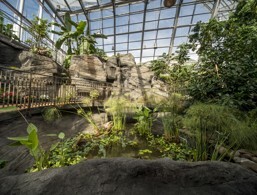 The Alpine tropical house is in an independent building and occupies another 600 m². The impressive architectural artwork of the Museum of Science features 7 floors full of exciting and varied themes.